Warmer temperatures could cause trees to grow more, and pollinate earlier, leading to more suffering for people with seasonal spring allergies. MILWAUKEE — More than 26 million Americans suffer from seasonal allergies each year, according to the American Academy of Allergy Asthma and Immunology Survey. This year, spring allergies are hitting Milwaukeeans extra hard. 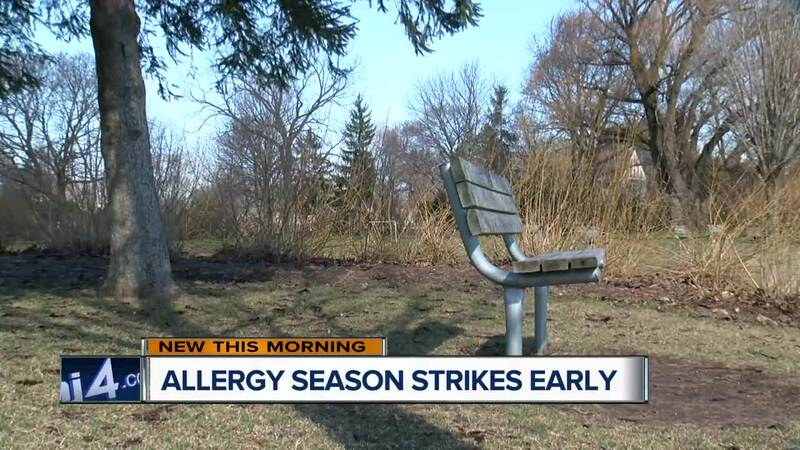 "Allergy symptoms typically start in April, but we did see more patients coming in March this year," said Dr. Lakshmi Kurre, a family medicine physician at Froedtert Hospital in Wauwatosa, Wisconsin. She noted there could be several reasons for the change — including an earlier spring thaw. Climate Central , which calls itself an independent organization studying the effects of climate change, reports the last frost of spring is occurring about one week earlier, on average, compared to 30 years ago. Kurre said warmer temperatures could cause trees to grow more, and pollinate earlier, leading to more suffering for people with seasonal spring allergies. That can mean a runny nose, watery eyes, a sore throat and sleep disruption leading to irritability and/or fatigue. "Those symptoms can hang around for months if you're not doing the appropriate treatment," Kurre said. "With the use of the right medicine, you shouldn't have to suffer those symptoms." She said over the counter allergy medicines can be effective. So can nasal saline rinsing devices like the neti pot. Mara Schulman, who suffers from seasonal allergies, said medicine is necessary to avoid them "taking over my life." "I've had allergies since I was three, so most of my life," Schulman said. "The spring is usually very hard." Curious about how global warming has affected the length of growing season (aka allergy season) where you live? You can read the research brief and find some handy maps here .